The Mason County Board of Education recently recognized winners of this school year’s county science fair. 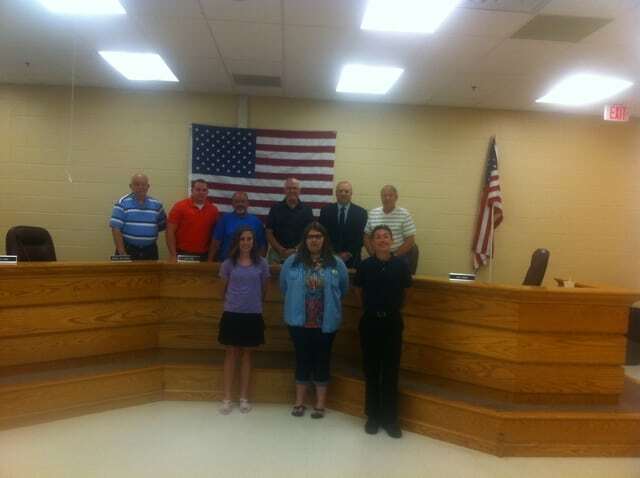 The Mason County Board of Education recently recognized winners of this school year’s math field day. The Mason County Board of Education recently recognized winners of this school year’s regional social studies fair. The Mason County Board of Education recently recognized winners of this school year’s county spelling bee and Golden Horseshoe winners. POINT PLEASANT — The Mason County Board of Education recently recognized students for their outstanding efforts in the 2014-15 school year. Golden Horseshoe winners: Dalton Coleman, Allison Henderson, Samantha Sturgeon, Madelyn Vanmatre. 2014-15 First Place Science Fair and Golden Horseshoe winners: Allison, Henderson; Atkinson, Ethan; Bonecutter, Jenna; Bonecutter, Kadann; Lambet, Chloe; Bonecutter, Ronnie; Brumfield, Justin; Bryan, Wyatt; Bush, Dane; Cheesebrew, Kendra; Coleman, Dalton; Cook, Sydney; Deal, Emily; Dunn, Kaitlyn; Eddy, Christian; Fields, Matti; Fisher, Emma; Halley, Allison; Harbour, Garrett; Henderson, Allison; Higginbotham, Eiona; Hunt, Trevor; Kapp, David; Morrow, Kaylee; Oldaker, Nicole; Pauley, Isaiah; Payne, Catherine; Porter, Cierra; Pyles, Olivia; Raymore, Adrianna; Rice, Emma; Sayre, Jackson; Smith, Alexis; Smith, Ashley; Stanley, Amelia; Sturgeon, Samantha; Vanmatre, Madelyne; Wamsley, Mikey. 2014 – 15 Regional and State Winners, Social Studies Regional Fair First Place Winners: Division I – Economics/Group – Mattie Ohlinger, Baile Bumgarner – New Haven Elementary. Division I – State and Local Studies – Isabella Barton – Point Pleasant Intermediate. Division II – Anthropology – Olivia Boggess – Leon Elementary. Divison II – Economics – Clairy Keefer – Leon Elementary. Division II – Sociology – Braylon Higginbotham –Point Pleasant Intermediate. Division II – Sociology – Hannah Fisher, Caroline Foreman – Point Pleasant Jr./Sr. High School. Division II – U.S. History – Mark Kincaid – Point Pleasant Jr/Sr High School. Division II – U.S. History – Briana Roush, Karli Stewart – New Haven Elementary. Division II – World History – Dylan Tayengco – Point Pleasant Jr/Sr High School. Social Studies Regional Fair Second Place Winners: Division I – Anthropology – Katey DeBoard – Ashton Elementary (has left the county). Division I – Anthropology – Caleb Cordell, Tanner Holten – Ashton Elementary. Division I – Economics – Annabelle Shrader – Point Pleasant Intermediate. Division I – U.S. History – Haven Roush – Point Pleasant Intermediate. Division I – U.S. History – Allison Tennant, Carolee Hoffman – New Haven Elementary. Division I – World History – Matison Brown, Keely Towner – Point Pleasant Intermediate. Division II – Psychology – Taylor Tatterson, Taylor King – Point Pleasant Jr/Sr High School. Division II – State & Local Studies – Sam Robertson – Point Pleasant Intermediate. Social Studies Regional Fair Honorable Mention: Division I – World History – West Baker – Roosevelt. Social Studies State Fair Second Place Winners: Division I – State & Local Studies – Isabella Barton – Point Pleasant Intermediate. Division II – U.S. History – Mark Kincaid – Point Pleasant Jr/Sr High School. Social Studies State Fair Third Place Winners: Division I – Economics/Group – Mattie Ohlinger, Baile Bumgarner – New Haven Elementary. Division II – U.S. History – Briana Roush, Karli Stewart – New Haven Elementary. Social Studies State Fair Honorable Mention: Division II – Sociology – Braylon Higginbotham –Point Pleasant Intermediate. Division II – Sociology – Hannah Fisher, Caroline Foreman – Point Pleasant Jr./Sr. High School. Mason County Spelling Bee Winner: Skylar Riffle – Wahama. Regional Math Field Day: Christopher Smith – Roosevelt 6th Grade – 1st place. Tanner Durst – PPJSHS 8th Grade – 1st place. Byrce Tyangco – PPJSHS 9th Grade – 1st place. Mason County 7-9 Grade Teams – 3rd Place Dylan Tayengco, Mackenzie Barr, Kaylee Nott, Tanner Durst, Zachary Terry, Jacob Lloyd, Bryce Tayengco, Cassidy Duffer, Jayson Bowen.